My costume after looking at the other entries is not nearly as high of quality but it was made by my when I was 14 I only used materials I could find around the house and still managed to engineer quite a cool costume. 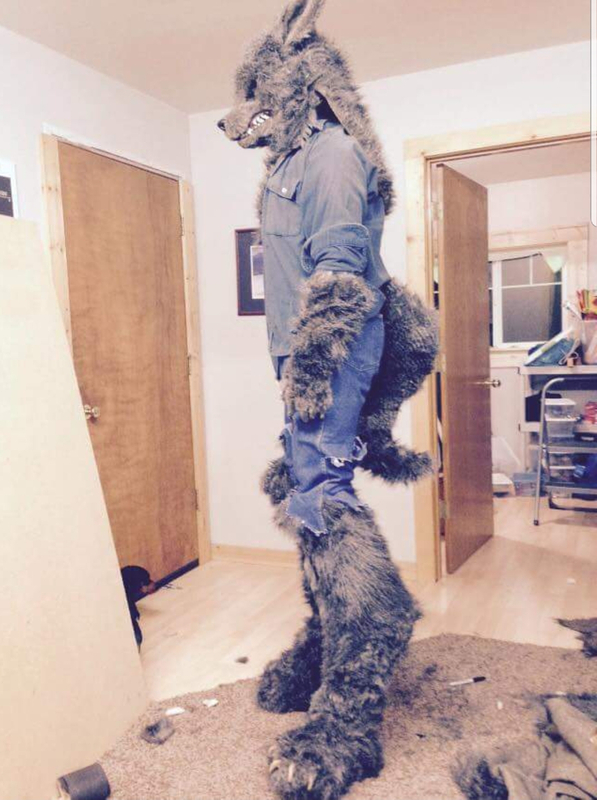 The mask is compleat with a moving jaw and eyes and the body is made up of a padded spandex suit with some gray fur I found in my moms sewing studio as well as some clothing to keep the human aspect of the werewolf, when fully in costume I stood just under 7 feet tall due to the stilts I made to give my legs a proper shape to be a humanoid wolf. The stilts are made of flooring we had ripped up, some tennis shoes, bungie cords and an old belt. The costume worked with or without the stilts so if I felt worn out or was in a height restricted building i could still be in full costume. I made full arm gloves out of gray garden gloves and claws I hand sculpted then I added the fur over which left the gray rubber part of the glove exposed to look like a paw pad. The fur is a bit crazy in this photo beacuse ot was about 5am and I had just finished it after all night building it. Yes I built it in one night. Over all the costume was a hit and my middle school loved it I then took it to a Halloween party then around town. For my budget of about 50$ I'd call it a success despite it not being as fancy as many others. I love costume making and design and will find a way to keep it in my life despite my budget no matter what.